Live one-on-one lessons on your pc, tv, or other device for an experience virtually identical to having me present in your home. With three live feeds to choose from, be it full body view, hand close up, or exercise/song material, you will have the same freedom to focus your attention wherever you feel it is most needed, just as if I were sitting right in front of you in the flesh. Just switch between whichever view suits you best at any given moment. With up to 1080p resolution and direct audio interface for the bass, you’ll get a clear picture and pure sound that will let you see what needs to be seen and hear what needs to be heard. With the ability to share desktop, you’ll not only be able to see whatever song or exercise material we might use for a given lesson, but you’ll also be able to follow my mouse as I point to specific notes or places in real time, just as you would if I were pointing to a book or sheet of paper on a music stand. All notes, transcriptions, tabs, charts, diagrams and anything else that would otherwise be written down into a book during a course of a lesson are written and compiled into a word program, saved as a file with your name, and emailed to you upon completion of the lesson. You’ll never lose track of what we covered in a lesson, and always have thorough notes for review. For those times when it is helpful to make a comparison, such as when trying to see how a scale illustration and the actual playing of the scale match up, splitting the screen for a side-by-side look offers an even better view than what you would get in person. 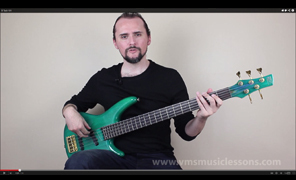 Online music lessons are live, one-on-one lessons just like you would receive if I were to come to your home, only carried out over the internet via one of the many video calling softwares (e.g.Skype). Just as in conventional lessons, you see me and I see you, only on our computer screens while we are sit in our respective homes. Except for the medium, the lessons are virtually the same. Are these video calling services free? Yes. You only need to sign up and download the software. There are subscriptions for more advanced options, but you do not need any of them for the online lessons. Once you decide you would like to pursue online lessons, we conduct a quick video call to ensure we both have adequate audio and video quality. If you are not familiar with any of the software or procedures involved (i.e. how to configure your web cam and microphone), then I'll gladly help you get started. Once we set up a time for the lesson, and after payment has been received, I give you a video call at the mutually agreed upon day and time, you accept the call, and the lesson begins. It's just that simple. Payments are processed through Paypal either with a credit card or through their direct service. Alternatively, you can send a check or money order. Just make sure to give enough time for the payment to be confirmed before the lesson is to start (e.g. don't mail a check out on the morning of the day we are to have a lesson). You can pay for as few or as many lessons at once as you like; no need to pay for a block of lessons (though you may eventually find it more convenient to do so). Purchase links are located at the bottom of every page. Is there a return or cancellation policy? Provided a lesson is cancelled more than 12 hours before the lesson is to begin, you can reschedule the lesson to another time, or apply the payment to a lesson at a future date. Any lesson cancelled less than 12 hours before the lesson is to begin will be forfeited. Unlike the typical 24 hours cancellation policy, I find 12 hours to be a time frame that is more considerate to my students, without being unfair to myself. If the lesson was not forfeited due to a late cancellation, your payment can be returned to you upon request, minus the processing fee (roughly 3%). Aside from the obvious needs of a computer and a musical instrument, you will need a webcam (if your computer doesn't already have one), a microphone (again, if your computer doesn't have one), and some way for me to hear your instrument if it is electrical, either by using an amplifier or by plugging directly into your computer (not the easiest method). High speed internet is also recommended. Lower speeds will not prohibit online lessons, but the video quality will suffer . Absolutely. On the Resources page, I have included links to a few sites offering programs and services we might use, as well as a few guides on how to help you better understand your computer's capabilities. If you prefer, I can even take you through it myself over the phone or video call. Which video services do you use? At this time, Skype is my primary medium, but I also have an account with Google Hangouts, should that be needed. WebEx and GoToMeeting worked well, but were missing some features I consider important for video lessons (e.g. camera control). How do I record video calls? Purchase ($20) and download Evaer, an add-on program used for recording Skype video calls. Experiment with the program to become accustomed with how it works, set your preferences, and record away. - You can record the lessons for later use and review. - You have quick access to online material and documents in the lesson, as we can share desktops through the video call to enhance communication and demonstrations. - No aggravation traveling anywhere and no money spent on gas. - Greater privacy at home without having to worry about tidying up before someone comes over. - Cheaper than conventional lessons, as I do not have to travel either. A lot services which offer online lessons are large businesses, sometimes with hundreds of teachers. Thus, in addition to the general marketing smokescreens and deceptions employed by such outfits (e.g. "our teachers are the best ..."), you're often dealing with the dreaded 'customer service representative' who may or may not 'monitor your calls for quality assurance' and all that other official and impersonal nonsense. With such places, you're part student, part customer. With me, though, you're 100% student. You'll never deal with anyone else and you'll always be treated like a regular.